Directions: Mix lemonade according to package directions. Add 1 1/2 C. flavored syrup to prepared lemonade. Chill and enjoy! *Flavored syrups are not available for purchase on-line. Monin, Torani and Savannah Cinnamon Company syrups may be purchased at the Mulberry Mill store in Branson, MO. Directions: Brew and flash chill loose leaf tea in a 2 Qt. 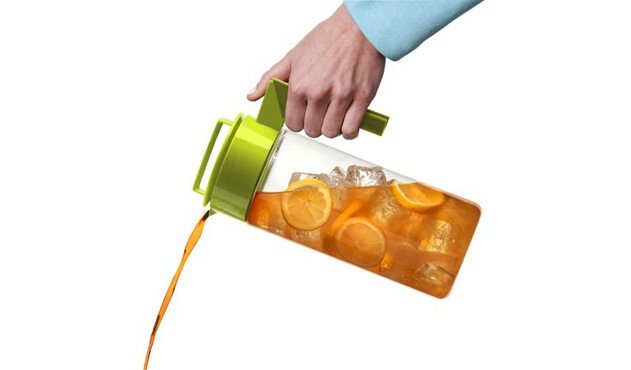 Takeya Flash Tea Pitcher. Add 1 C. Mango syrup. Stir and enjoy! Directions: Combine all ingredients together in a bowl. Mix well. Chill at least 3 hours, or overnight for best flavor. Here at Mulberry Mill, we add 1/2 C. shredded cheddar cheese as our variation to the original recipe. Directions: Combine and blend cream cheese, sour cream and 1 package of Spinach Parmesan dip. Stir in Mozzarella cheese shreds. Stir and heat until warm and creamy. Works well in a small crock pot or can be warmed in the microwave, if in a hurry. Here at Mulberry Mill, we substitute Mozzarella cheese instead of the Monterey Jack cheese that the original recipe uses. Directions: Pour oil and 1 package of Original Savory Saltine Seasoning into a 2-gallon Ziplock bag. Add all other ingredients to oil mixture and zip the bag shut. Leave air in the Ziplock bag when it is closed. Tumble the bag a few times and let it set to allow the oil mixture to be absorbed. Directions: Hard boil 8-12 eggs. Slice eggs in half, lengthwise and put yokes into a separate bowl. Add 1 C. mayo and 1 packet of Sassy Green Sauce to yokes. Mix well. Scoop mixture into hard boiled egg white halves. Directions: Blend cream cheese, Cool Whip and 1 packet of Zesty Lemon Basil together until smooth. Scoop mixture into graham cracker pie crust. Chill over night. Dessert may be topped with strawberries and additional Cool Whip, if desired. Directions: Cook pasta according to box directions. Drain pasta noodles, then rinse with cold water. Combine 1 package of Tasty Tomato Basil dip mix, cooled noodles and all other ingredients into a large bowl. Refrigerate 1 hour or until cold. Salt to taste. Directions: Add 2 1/3 Tbsp. (or more to taste) Fireside Salted Caramel Cocoa to 2 oz. of hot water. Stir until dissolved. Pour over ice and add 2 oz. of cold water. Stir and enjoy. Top with whipped cream, if desired. Optional: top with chopped pecans. Directions: Mix ingredients together and pour into a greased and floured Bundt pan. Bake for 45 min at 350*. Cool 10-15 min. Drizzle glaze on top. Directions: Mix ingredients into a bowl. Chill 30 minutes before serving. Directions: Mix ingredients into a bowl. Form a log or ball. Coat with chopped nuts and parsley. Chill for 1 hour before serving.